It was a typical day for Thayer Central High School senior, Russell Heitmann. Fall sports were in full swing and he had just returned from competing at a cross country meet. As he returned to the school to grab his things and presumably get ready to head home or watch classmates compete, he was approached by his teacher and asked to do some impromptu work and commentate the volleyball game that was just about to start. With a makeshift microphone and no experience in commentating, Heitmann said, ‘ya know, what the heck’. He took a non-traditional approach of calling that volleyball game, possibly because he had never done it before, maybe because his talents led him that way; for whatever reason, his feedback was positive. It was a simple decision to help out that day. He chose to do something he didn’t think he would ever do. From that day; that volleyball game, he didn’t realize he not only may have been the first ever Striv sports commentator, but he also may have just realized one of his deepest passions. The decision Heitmann made that day, five years ago, may have shaped his future. With the ‘performance gene’ very much ingrained in him as his mom was his speech and drama teacher in high school, Russell’s ability to speak in front of people came natural and from a very young age. Since fourth grade, he had performed. As a Thayer Central student, he was able to compete and succeed in ‘Poetry Out Loud’ and that carried him into the National Competition in Washington D.C. This, along with his growth and know-how of calling games, it started to become not only easier, but he encountered lots of enjoyment from it. Currently, Russell Heitmann is a Hastings College senior and in the school’s College Media Professional courses well on his way to a flourishing career in the media industry. He notes that his mom probably and more than likely saw his fate in broadcast before he even realized it, but he took a J-term class of Sportscasting in college and signed on to color commentate the UNK vs Hastings game. 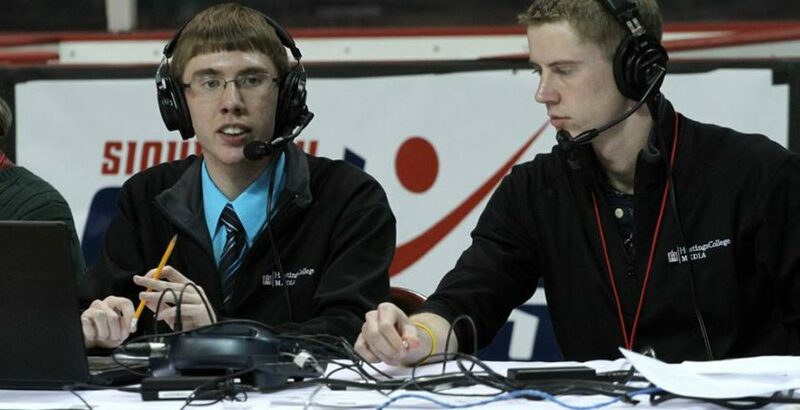 From that game, he thought, “wow, this is what I want to do.” He now majors in Comm Studies/Broadcast Journalism at Hastings College, a college notably second to none in its Broadcast program. 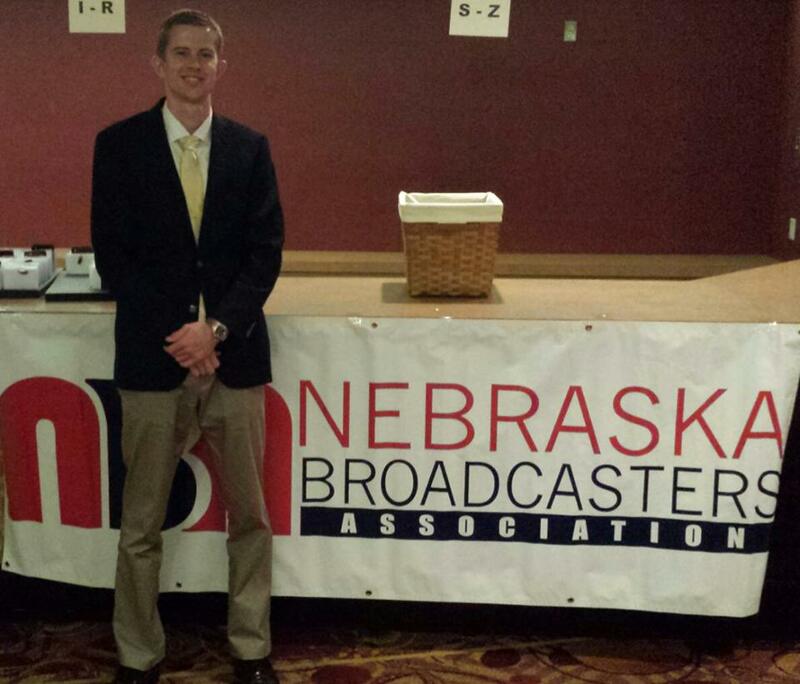 With his growing talent in broadcast and attending Hastings College, he is provided vast opportunities. He had the opportunity to work in the Athletic Department in Communications and Promotions at the University of Kansas. He got a feel for how a larger collegiate operation works. He was also granted some unmatched experience at one of the largest, most powerful AM Sports Radio stations in the country. He accredits his dad’s avid listenership to the station as another reason for this opportunity. His dad heard the PSA for summer interns at 810 and passed that information along. Russell seized the moment and landed an amazing growth opportunity. The internship allowed him access to marketing events, he did promotions, even caught some air time on a couple of occasions. Russell or ‘Russ’ was indoctrinated with the nickname ‘Griswold’ (comedy movies buffs can laugh now). He learned the importance of personal confidence and preparation as well as presentation on air. He got a great understanding of good broadcasting at the station and understood that, in broadcasting, if your voice isn’t interesting, people aren’t going to listen. He initially got a little shaken, but gain a comfortability level, learned how big time organizations function and ended up hosting his own segment. He learned from some of the best and you can bet his dad was listening every day that summer. Heitmann has proven himself as a hard working, talented media student. But with everything he has already taken on and accomplished, what is next on his agenda after he leaves Hastings College? He says he ‘goes where the job takes him.’ Hastings has prepared him and he doesn’t feel ‘pigeonholed’ into strictly one medium. He dreams of traveling with a Division 1 basketball team or other ‘big time’ team as their videographer. He also loves calling college basketball games, but mainly he says he wants to do something where he can tell the stories; through commentary, video, or the like. He wants to show more than just a game, but what makes them who they are and where do they come from. From grabbing a mic after a cross country meet in high school to tackling some of the most powerful media positions out there as a college student; we look forward to seeing what Russell Heitmann is doing in five more years and just how much more he has been able to accomplish and all the success that is headed his way. Thanks to Russell Heitmann for sharing your story; we look forward to more.